Takeover contender: A Bharati shipyard at Ghodbunder, Pune. Bangalore/ Mumbai: The battle for Great Offshore Ltd, India’s largest integrated offshore services firm, has taken a new turn, with Bharati Shipyard Ltd planning an appeal against the market regulator’s move allowing it to make an open offer for Great Offshore under a rule that would bar it from taking management control. The Securities and Exchange Board of India, or Sebi, on Wednesday approved open offers planned by Bharati Shipyard and ABG Shipyard Ltd, the country’s largest private shipyard, to buy an additional 20% of Great Offshore from the public. The shares of Great Offshore rose by 3.14% on Thursday to close at Rs535.50 on the Bombay Stock Exchange (BSE) even as the exchange’s benchmark index, the Sensex, dropped 1.25% to close at 16,785.65. Shares of Bharati Shipyard rose 0.88% to close at Rs165.65 and ABG Shipyard gained 0.64% to end at Rs201.15. Bharati Shipyard now holds a 23.17% stake in Great Offshore and ABG Shipyard’s stake is 8.29%. Under Indian company law, any investor holding a 26% stake or more in a firm can block any special resolution and, thus, effectively wield management control. Some experts say that if Bharati Shipyard buys shares through its open offer under Regulation 10 of takeover norms, for which it has received regulatory approval, it may not be able to take management control of Great Offshore. The market regulator has given its consent for an open offer with management control—under Regulation 12 of takeover norms—for ABG Shipyard, but for Bharati Shipyard, the approval is for an open offer without management control (Regulation 10). In May, Bharati had made the open offer under Regulation 10. This meant it was buying shares in Great Offshore as a strategic investor. But after ABG Shipyard entered the takeover battle in June, Bharati Shipyard changed its open offer plan, seeking management control of Great Offshore under Regulation 12. Sebi has struck down this change while approving the open offer. “ …the issue has been examined and the first bidders (Bharati Shipyard) have accordingly been advised to revert to the original position, i.e. to make an offer only under Regulation 10…," Deep Mani Shah, a Sebi executive, wrote in an 18 November letter to Bharati Shipyard and ABG Shipyard. “According to Sebi, the change in the structure should have been done within 14 days of making the open offer. We did it after 14 days," Kumar of Bharati Shipyard, one of the two promoters of the company, told Mint. ABG Shipyard, in contrast, made its open offer under Regulation 12. “We have received approval from Sebi to make an open offer under Regulation 12," said Dhananjay Datar, chief financial officer, ABG Shipyard. Analysts are divided on the issue. While one section says that Bharati Shipyard will indeed have effective management control as it can block resolutions once it acquires 26%, and the term “management control" is not defined in the company law, others say Bharati Shipyard will not be able to occupy the driver’s seat. “It’s a big blow to Bharati," said Navindar M., analyst at Mumbai-based brokerage Natverlal and Sons Stock Brokers Pvt. Ltd.
As per the Sebi decision, Bharati Shipyard will have to make the open offer under Regulation 10, but if it wants management control of Great Offshore, it will have to make another open offer under Regulation 12. “This would require additional money and make the deal too expensive for Bharati," Navindar said. Technically, Bharati can appeal against the Sebi decision either in the Securities and Appellate Tribunal or in a high court. Such an appeal would delay the takeover process. “In our view, permitting Bharati to appoint majority directors will have adverse implications on the simultaneous open offer by ABG as ABG’s right to exercise any “control" will be blocked. Therefore, Sebi has refrained from permitting Bharati to have any controlling right at this early stage," said Akil Hirani, managing partner at Majmudar and Co., an international law firm. According to Hirani, this seems to be a well-thought-out move by Sebi as “permission to one acquirer should not act to the detriment of another, when both are making open offers at the same time and will have substantial holdings pursuant to the offer". 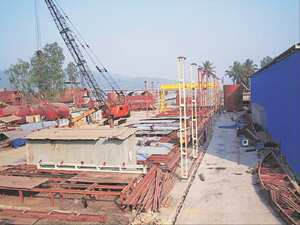 Both ABG Shipyard and Bharati Shipyard are eyeing Great Offshore’s assets and customers to derisk their main business of constructing ships as the global shipbuilding industry faces an uncertain future, after the current orders are executed, due to a slump in demand. Buying Great Offshore would help either of them to quickly enter the lucrative business of supplying ships to the offshore oil industry. The entry rules for new firms venturing into the support vessel supply business are stringent, both in India and elsewhere. Sixteen of Great Offshore fleet of 41 vessels are capable of servicing the deep-water oil exploration market. Moreover, a large number of ships in its fleet have to be replaced over the next five years, bringing captive business to the shipbuilder who succeeds in acquiring Great Offshore. Bharati’s interest in Great Offshore is much deeper. It is constructing one oil drilling rig and a support vessel for Great Offshore, together worth around $220 million (Rs1,021 crore). Vijay Kantilal Sheth, promoter of Great Offshore, lost management control after he pledged shares with the promoters of Bharati Shipyard for a Rs240 crore loan in January. When he failed to repay the loan, the promoters of Bharati Shipyard acquired the 14.89% stake that Sheth had pledged with them. Bharati then announced a public offer at Rs344 a share to the shareholders of Great Offshore in line with India’s takeover laws. ABG Shipyard entered the battle in late June, offering Rs375 a share, and that forced Bharati to raise its offer to Rs405 a share. ABG Shipyard sweetened the offer first on 30 July to Rs450 a share and again to Rs520 a share on 4 August. In September, Bharati Shipyard revised its open offer price to Rs560 after buying some shares in Great Offshore from the open market.